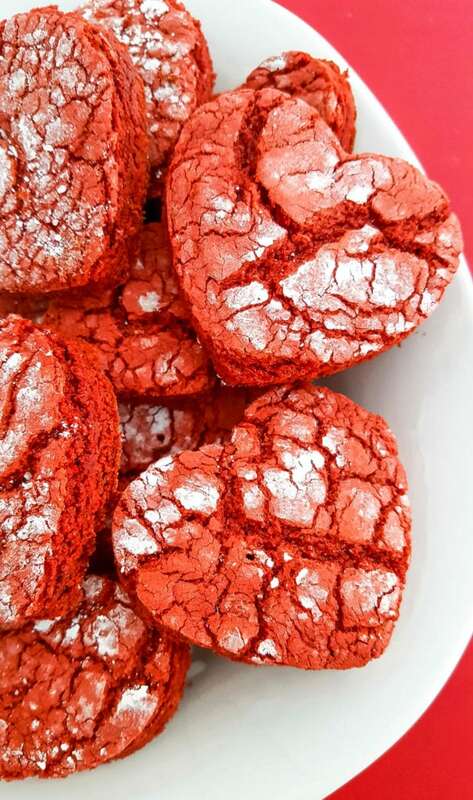 Valentine’s Day just got a little sweeter with this easy recipe for Heart-Shaped Red Velvet Crinkle Cookies using box cake mix. 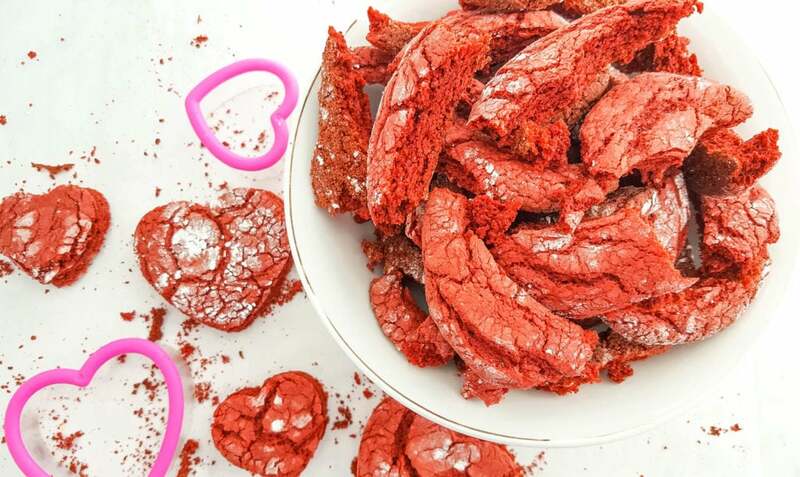 If there was ever a reason to bake a batch of heart-shaped red velvet crinkle cookies it’s Valentine’s Day! 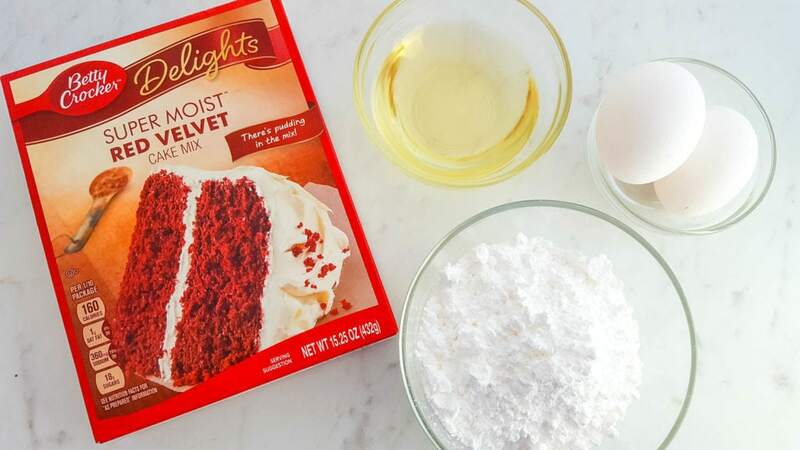 Red velvet cake is more elegant than plain chocolate cake and its stunning red hue makes it ideal for February 14th or any other special celebration. I’ve shared other recipes for crinkle cookies on the blog before, including this Chocolate Crinkle Cookies Recipe, but I don’t think I’ve mentioned how they are different than regular baked cookies. 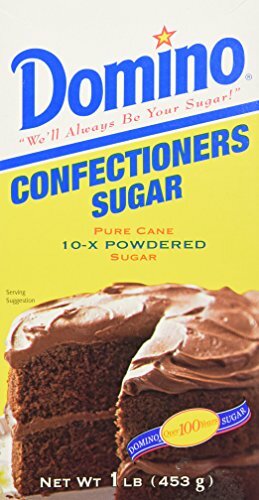 Crinkle cookies typically start with box cake mix, so they are moist and chewy. The addition of powdered sugar before baking gives the cookies a crinkle or cracked appearance when they come out of the oven. The result is a soft and chewy cookie center with a slightly crunchy exterior. 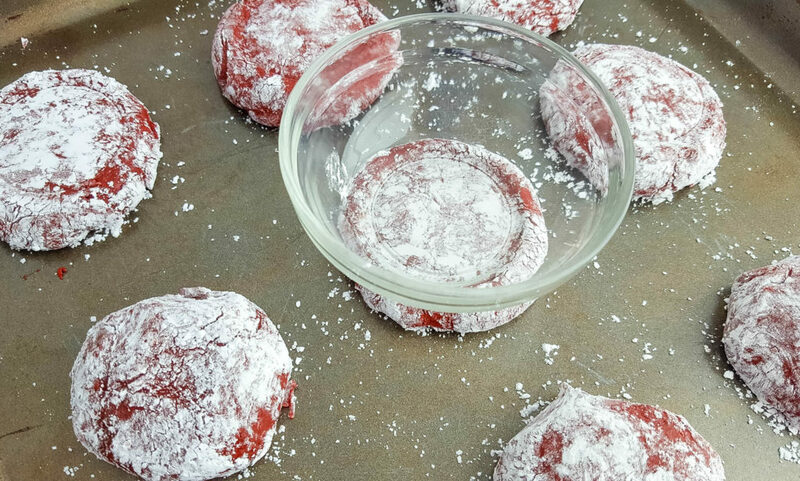 Red Velvet Crinkle Cookies are one of the easiest cookies to make at home because they start with a box of red velvet cake mix. 2. 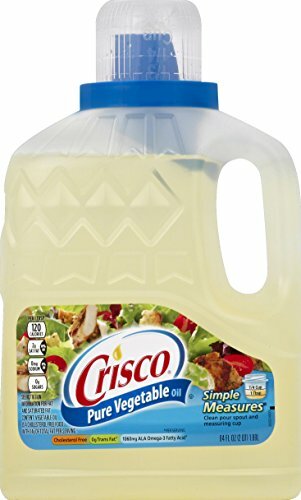 In a medium bowl, combine cake mix, oil and eggs. 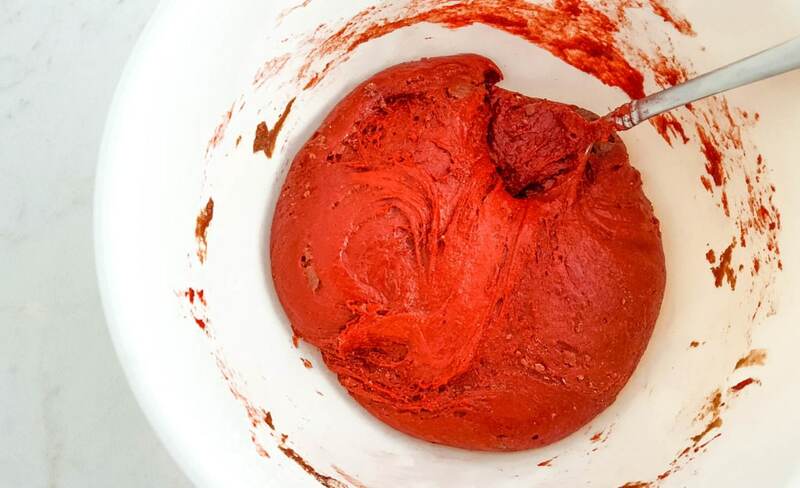 The red velvet cookie batter will firm up towards the end and be thick and sticky. 3. 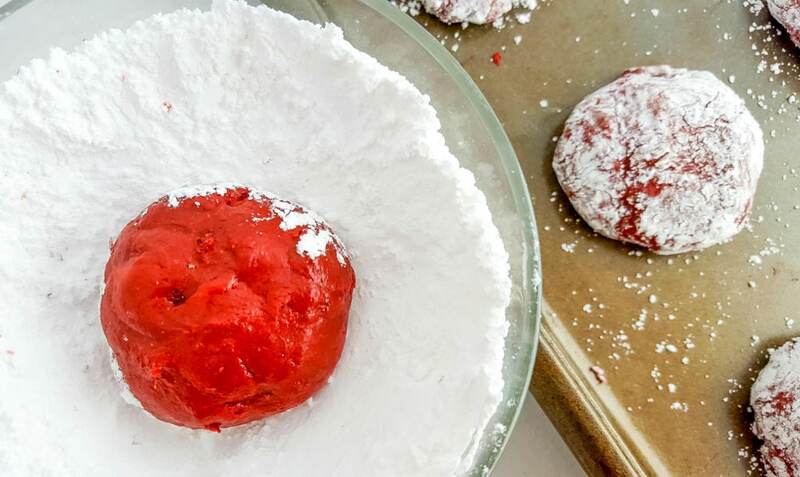 Using a tablespoon or cookie scoop , spoon the dough into balls and roll in powdered sugar to completely coat. 4. Place cookie balls on baking sheet approximately 2 inches apart. 5. Using a small bowl or cup, flatten the balls slightly so they spread out more while baking. 6. Bake for 9-11 minutes or until cookies have a hint of brown on the edges. Allow cookies to cool. 7. Once cooled, use a heart-shaped cookie cutter to cut out heart-shaped cookies. 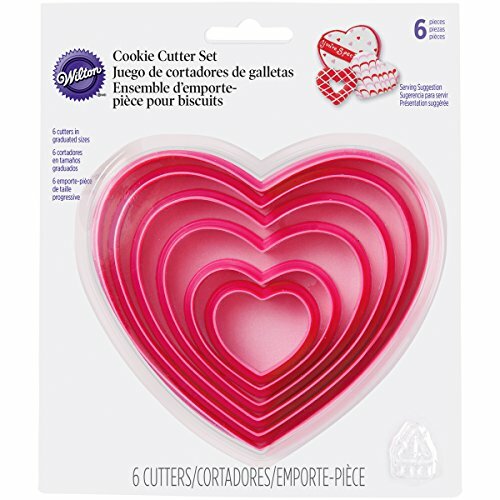 You can use multiple sizes of heart-shaped cookie cutters to reduce excess cookie scraps. Don’t let the scraps go to waste though—the outside trimmings of the red velvet cookies can be chopped and combined with popcorn for a yummy snack (add melted white chocolate and pink and red sprinkles! ), or even added to ice cream for an after-dinner treat. In a medium bowl, combine cake mix, oil and eggs. 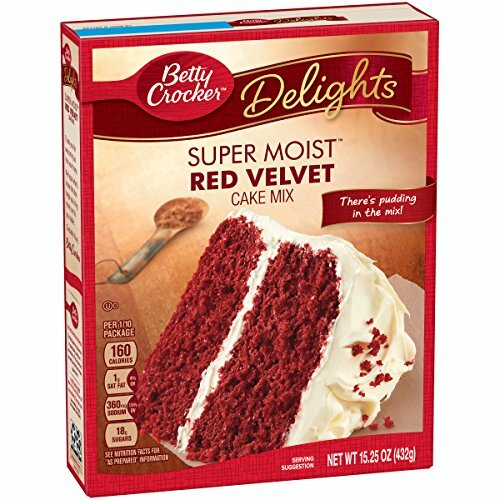 The red velvet cookie batter will firm up towards the end and be thick and sticky. Once cooled, use a heart-shaped cookie cutter to cut out heart-shaped cookies. 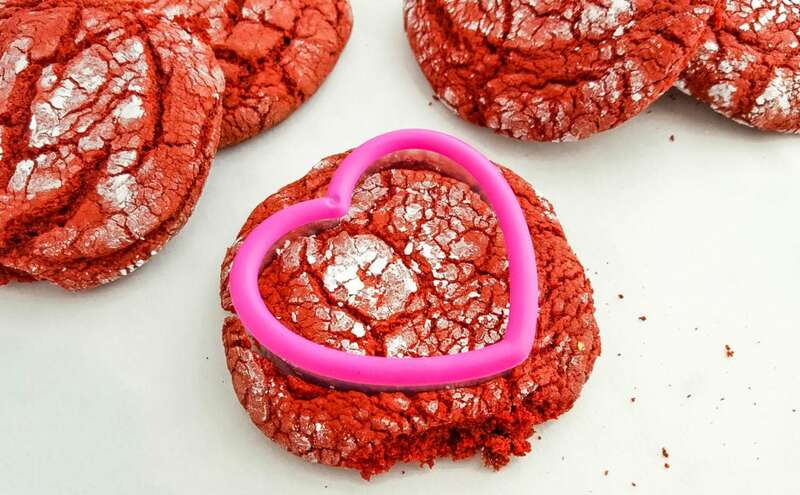 If you’re feeling extra fancy, you can pipe cream filling between two heart-shaped red velvet cookies, similar to my recipe for Brownie Whoopie Pies with homemade raspberry buttercream filling. It is so interesting to find out an alternative of chocolate cake in the valentine’s day!!! Thank you so much. 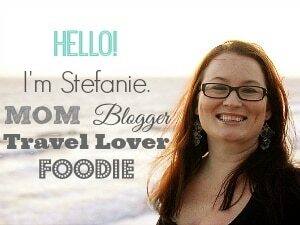 Your recipe is clear and though that most of your reader try that at home like me. I think travelers can make it in the bush as well for more appealing day.